The economy in 2013 is still defined by the financial crisis now six years old. The recovery from the worst recession since WW2 has been weaker than almost anyone expected - wages are still lower than they were ten years ago (and have just - barely - started to grow again), unemployment remains above 2 million, and an extra £300 million is added to the national debt every single day. It’s a long way away from the quick recovery and quick reduction in the deficit that the Government planned in 2010. The economy barely grew at all last year (barely avoiding a “double dip” recession thanks to the Olympics), and until recently it wasn’t expected to grow much at all in 2013 either. And driven by increases in VAT and oil prices inflation has been much higher than target or expected - eating into people’s barely-growing wages. Why? It depends who you ask. Plenty of economists (and left-leaning politicians) believe that austerity is to blame. Tax rises and job cuts in the public sector have, they argued, happened too quickly and too soon (if they needed to happen at all), throwing a fragile economy back off track. Their prescription is to loosen the grip on public spending that the Coalition has implemented since 2010. 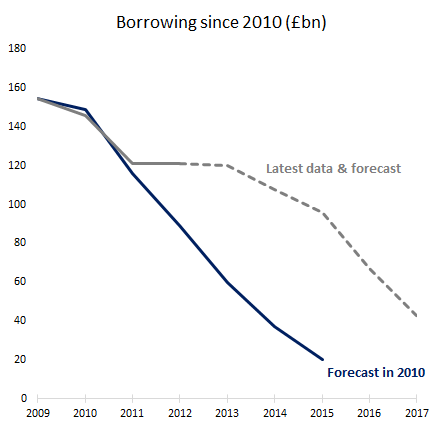 The counter argument is that the government has eased off since 2010 - letting a slowing economy naturally increase borrowing - but that to do more would be a risk to the UK’s ability to borrow at decent interest rates, placing a larger burden on future generations, with debt a higher burden on the economy than the 1960s. According to them, the UK’s slower recovery has far more to do with the euro-area crisis and oil prices than it has to do with austerity. But if those “green shoots” of recovery have been hard to spot so far, there have been more sightings recently. 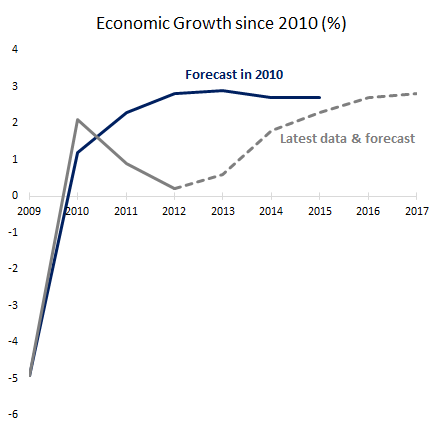 Immediately after a gloomy budget in 2013 (where growth forecasts were cut - again) the economy seemed to turn a corner. The next forecast is expected to be much more positive, and wages are just about starting to grow again - just in time, you might cynically note, for the next general election. Whether the government chooses to press on with bearing down on the deficit, or to loosen the purse-strings, the question is - will it be enough to balance three years of underachievement in the eyes of voters?